What if 3D printing were the killer app to enhance education in a way never seen before? 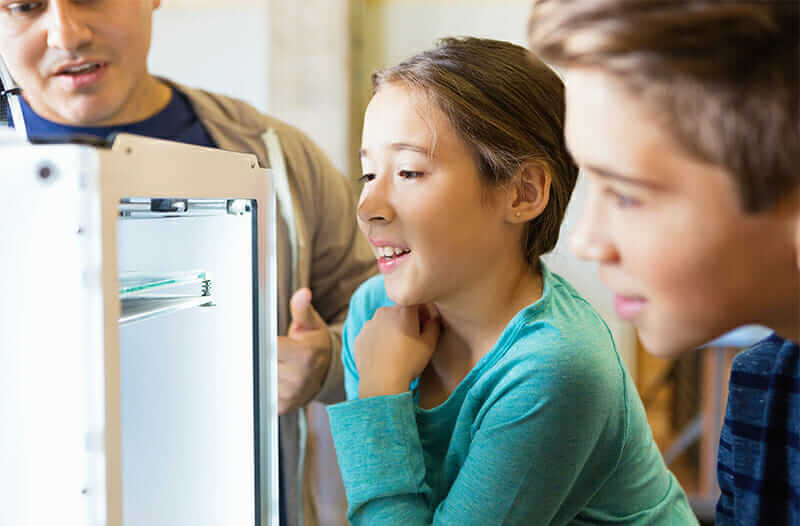 If recent surveys and reports are to be trusted, 3D printing in education could be the key to preparing students to enter the workforce and much more. Within four years, 3D printing will be partially responsible for a situation in which “more than a third of the desired core skill sets of most occupations will be comprised of skills that are not yet considered crucial to the job today,” according to The Future of Jobs (PDF), a January 2016 report by the World Economic Forum. It would seem then that, globally, the education system has an opportunity and an incentive to make 3D printing a priority in the classroom. After all, the roots of experiential, hands-on learning are well established, dating back to the second industrial revolution in the U.S. In 1896, John Dewey, considered one of the most important thinkers of the 20th century, opened the first laboratory school at the University of Chicago. Dewey’s brand of progressive education eschewed traditional, rote teaching methods in favor of thinking and doing. At the time, many great inventions came from individuals—such as Charles Grafton Page, Michael Faraday, and Joseph Henry—using their powers of observation and deductive logic, rather than academic training. Building on the work of Dewey, in the early 1990s, Seymour Papert developed the educational theory known as constructionism, which advocates for teaching both in context and with an understanding of a student’s motivation for learning. Papert’s idea of experiential learning is the motivating force behind one effort promoting 3D printers for schools: FabLab@School, a “worldwide growing network of educational digital fabrication labs.” The project encourages the physical creation of objects using 3D printers and laser cutters in collaboration with peers, and aims to engage children in resolving actual problems. The problem-solving theme inherent in 3D printing is something parent and educator David Lewis knows well. Lewis and his son Riley’s story illustrates another successful use of 3D printing in education. As a seventh grader, Riley attended a large 3D-design and technology conference, where he learned all about 3D printing. And from there, Riley was hooked—so much so that within the year, by “tin-cupping for equipment and licenses,” Lewis says, Riley had equipped himself with the tools and skills to create his own 3D-printing lab. Despite his son’s success, Lewis was disappointed that this opportunity was not available to a wider group of students. So, on Riley’s initiative, Lewis approached Discovery Charter School in San Jose, California, to offer classes in 3D printing, CAD software training, and related skills. The school agreed, and since 2012, Lewis’s classes have benefited more than 200 students, including a number who have created successful Kickstarter projects. Lewis has also taken the project to other local schools, Stanford Splash events, and Maker Faire. A recent STEM study by ACT, the organization responsible for the eponymous college-admissions test, shows that such success stories are not the norm. A key finding of the report is that high school students in the current system are “not well prepared to succeed” in STEM majors and, by extension, careers. Indeed, early education seems dependent on the action of motivated individuals, like Lewis, rather than a coordinated effort by school districts or governments to give students the boost they need. However, the funding to put a 3D printer in every classroom would not solve the preparedness problem overnight. But when integrated in an appropriate manner, 3D printers are vital tools for historic scaffolding. Historic scaffolding uses online models of objects in the Smithsonian collection and other artifacts, such as patent descriptions or inventors’ notebooks, to re-create and reinterpret key inventions and the scientific principals they are based upon—or, in other words, using engineering, mathematics, and science in realistic situations. Incorporating a 3D-printing program successfully requires cross-departmental coordination to ensure that a program can flow in a seamless manner. Lipton warns against “cookie-cutter or do-ABCD labs,” which are easy to grade but lack experiential freedom and fail to unlock engineering’s potential. However, when it works, students find the abstract scientific and mathematical concepts can be applied and even refined. And those strides have lasting positive effects on future coursework, college-entrance exams, and even career prospects.